The York Power Rakes are pto or hydraulic powered soil pulverizers/conditioners that give you one of the easiest, fastest, and most efficient methods of removing vegetation, and breaking up top soil and clods into a smooth surface ready for overseeding. 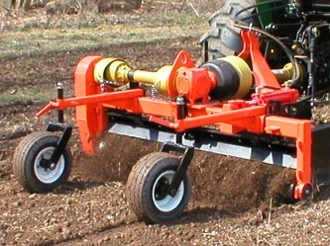 These units are great for making a smooth seed bed and removing rocks; all units have an adjustable urethane barrier that regulates how much material you process and how fine the output is; surface debris such as rocks that are too large to pass between the barrier and the roller will be dragged forward and held in front of the roller between the end boots on the machine where they can be dragged off for disposal. Pto powered models are available in a 5 ft. width for compact tractors and 6 ft., 7 ft., and 8 ft. wide models for larger landscape tractors. The hydraulic powered model for mounting on skid steer loaders is available in widths of 6 ft., 7 ft. and 8 ft. All models are available in either manual or hydraulic angle versions. These machines produce one the best prepared seed beds possible, and since they are powered by pto or hydraulics, they are the easiest to use and most efficient machines available for high production work.